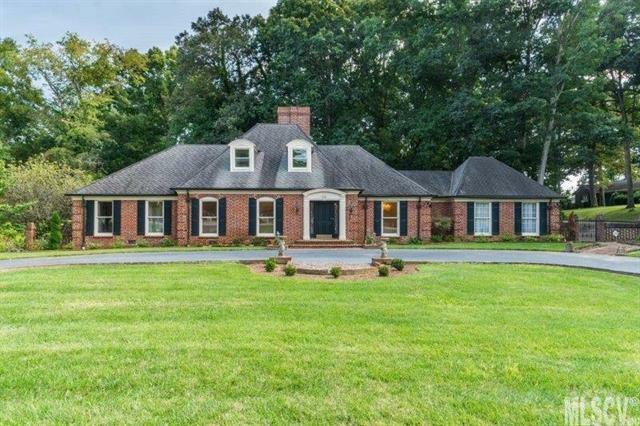 Stately Brick home has been remodeled/updated throughout. Main level now offers Living room, Dining Room, Kitchen with gas range, stainless appliances open to Great room with fireplace, access to Sunroom overlooking courtyard and very large Den/Rec Room. Master Suite/bathroom with granite, walk-in shower. Additional main level bedroom with double vanity. Laundry room w/ sink. Newly finished second level with two bedrooms/full bathroom and attic storage access. Covered back Patio. Large corner lot has circle drive and separate drive to oversized garage with storage. Architectural Details/Detailed brick work, Built-Ins, Tall Windows, Hardwood, Tile, Granite, Neutral Paint, Irrigation. Convenient to shopping, restaurants, downtown, 127 and 321.